Rarely do the financiers of a historic hotel evoke a sense of grandeur and fame. The Hollywood Roosevelt is that rare exception. The brainchild of legendary filmmakers Douglas Fairbanks Jr., Mary Pickford, and Louis B. Mayer, the Hollywood Roosevelt opened its doors on May 15, 1927. 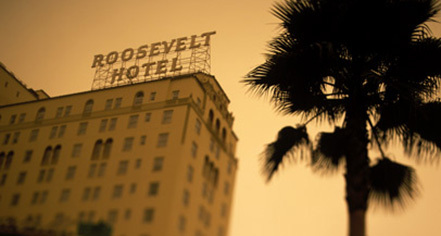 Taking its name from popular U.S. President Teddy Roosevelt, the hotel cost $2.5 million and immediately became a landmark in Los Angeles. Just two years after its opening, the Hollywood Roosevelt hosted the very first Academy Awards, the only year that the event was intimate enough to be held in a hotel ballroom. Famous guests and residents are synonymous with the Roosevelt, including Marilyn Monroe, Clark Gable, and Carole Lombard, whose memories are now preserved with hotel suites named in their honor. 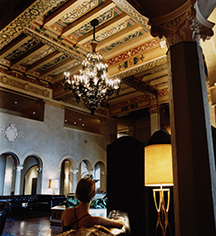 A major renovation took place in 2005, which brought the historic hotel to the forefront of modern luxury. Its history is carried throughout the intricately decorated rooms and public spaces, and its nightclub Teddy’s welcomes today’s stars while paying homage to the original nominal inspiration.